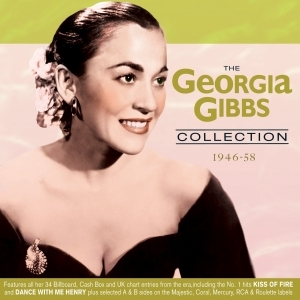 Georgia Gibbs was a singer whose background was in jazz and big bands during the 1940s, but who was so astonishingly versatile that she was able to turn her hand to just about any kind of music with equal panache and credibility and as a result built an extraordinary hit career that brought her well over thirty hits during her career. She was very much part of the middle-of-the-road pop scene of the early ‘50s, making her debut with a No. 5 hit with “If I Knew You Were Coming I'd 'Ve Baked You A Cake” in 1950 and had a No. 1 with the dramatic “Kiss Of Fire” the following year. She gained a certain degree of notoriety during the mid-‘50s when she became one of the mainstream white pop artists to achieve chart success by recording cover versions of big hits from the R&B charts, scoring a No. 2 with a version of Lavern Baker’s “Tweedle-Dee” and a No. 1 with a cover of Etta James’ “The Wallflower” as “Dance With Me Henry”. By the end of the ‘50s she had racked up an impressive 34 chart entries. This great-value 56-track 2-CD covers the era from her recording debut in 1946 through to the time when her music had largely been overtaken by the rock ‘n’ roll era and its aftermath, and includes early recordings for the Majestic label, which illustrate her musical roots, plus subsequent releases on the Coral, Mercury, RCA and Roulette labels, and naturally features all her hits, plus selected A & B sides which amply illustrate her remarkable talent to perform across the pop spectrum with aplomb.